KOHLER. IN POWER. SINCE 1920. Our latest marine generators are smaller and quieter with less vibration than previous models. Intentionally designed to go unnoticed. NOW EQUIPPED WITH PE ACE AND QUIET. Our redesigned sound shield—with separate engine and alternator compartments—and improved air management system significantly reduce sound levels. The quiet is all you hear. 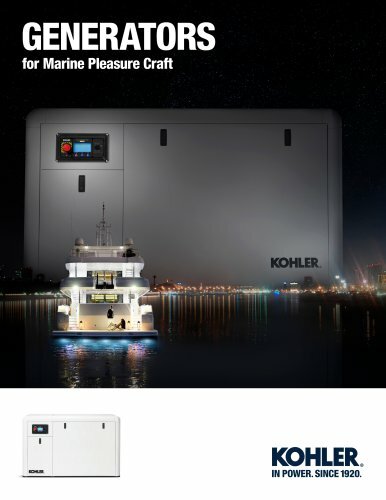 Generator Model Length x Width x Height mm (in) H - Housed / U - Unhoused / R - Radiator WHY KOHLER® PROVEN RELIABILITY Every KOHLER, marine generator is extensively quality-tested—before model release and before leaving the factory. The result is proven reliability. PREMIUM LIMITED WARRANTY We cover the first two years, with the option to purchase additional years. GLOBAL SUPPORT With nearly 1000 sales and service locations around the world, we’re everywhere you go. *kW rating varies by voltage. Consult the generator spec sheet for more detail. KOHLER. 09001 ■■K^rVtSTEMS NATIONALLY REGISTERED KOHLERPOWER.COM 9/18 © 2018 BY KOHLER CO.